What is a bicycle poker ride? 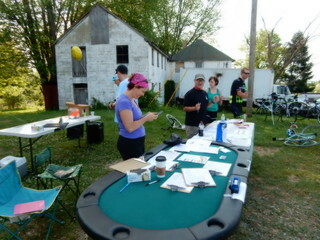 Our Poker Ride is just like any other cycling Metric Century (100 km, 65 miles) with one exception; as cyclists ride the route throughout Jefferson County, WV, they draw a playing card at each Card Station (Rest Stop). The object is to have fun & get the best poker hand at the end of your ride. Prizes will be awarded to the top 3 poker hands. (Must be 21 to win.) If you don't like poker, you don't have to draw cards, simply come enjoy the beautiful ride. 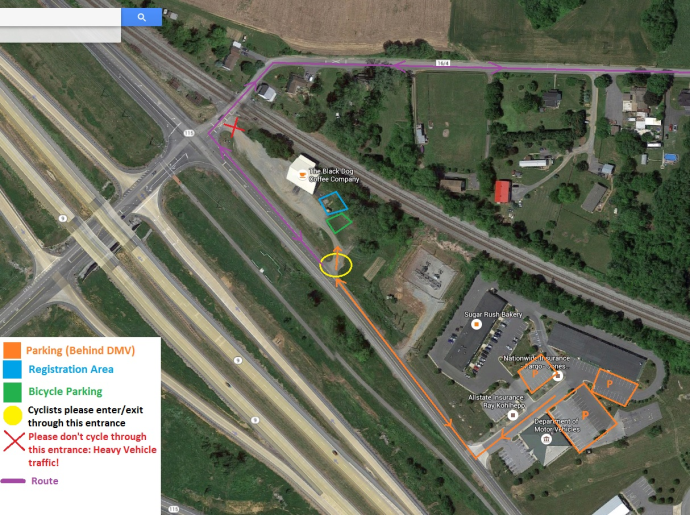 The Poker Ride Metric Century (65 mile) route will start & end at the Black Dog Coffee Shop in Bardane, WV. With ~2700 ft of elevation gain, there are some hills, but it's not all climbing. It will circle most of Jefferson County, WV including Shepherdstown, Kearneysville, Leetown, Meyerstown, Bloomery, Bakerton & of course Bardane. 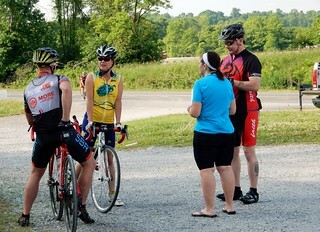 There will be a "bail out" option after rest stop #2 that cuts the mileage down to about 31 miles. Please see the 31 Mile Road decription below. 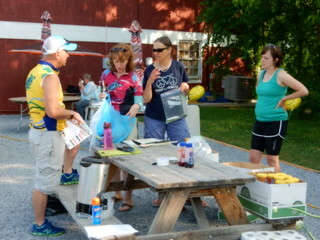 Rider will pick up a registration packet with score card, Q-sheet and map. At each of the five stops (4 along the route & 1 at the finish), one card will be drawn from a bag containing one full playing card deck (52 cards) without jokers. The Poker Stop Event Staff monitor will place a unique stamp on the score card for the rank and suit of the card drawn. The playing card will be returned to the bag. No duplicate cards; if you draw a card that you already have, you must return it and drawn again. The riders will go to the next stop. After the last (4th card) stop, the riders will proceed to Black Dog Coffee Shop. Before turning in the score card, riders will be given the opportunity to purchase additional cards. The cards will be drawn from a bag the same as the poker stops and recorded by event staff. The best 5 cards will be used from the score card for ranking. Poker ride may be completed at the riders own pace, but participants must be back at the Black Dog Coffee Shop by 2:00 pm. The standard poker hand rules will be used to rank the completed score cards. Prizes will be awarded to the three best hands. No wild cards. 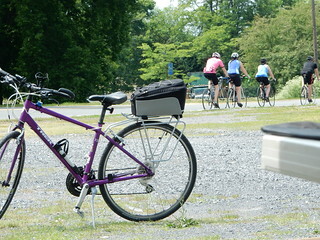 Tandems and tag-alongs are allowed on bike course, but all participants must pay the entry fee. You may not have someone else draw your card. Score card station attendees must sign and stamp your score card at each station. Riders that cannot gather five cards in the allotted time may draw remaining cards at the Finish. If you lose your score card during the ride - too bad. * Players who want to play multiple hands you must specify at each Card Station which score card you are about to draw for and present it to the Card Station Manager. You will then draw a card & the Station Manager will mark your score card. You may then present your next score card and draw the next card. Riders do not get to draw multiple cards and choose which cards go to which score cards. You can purchase up to five replacement cards at the following dollar amounts at the closing table at the end of the ride. To save time the day of the ride, if you have any questions about the rules please email us at panhandlepedalers(at)gmail(dot)com with your questions ahead of time so we can get them answered for you. We are currently working to bring you some awesome swag.